In the endemic areas in the north of WA and the NT, seropositivity rates are very high among indigenous communities, with most being infected before the age of 10 years, indicating that there is often sufficient activity to lead to human infections. In areas of regular epizootic activity, seroprevalence is lower but very high seroconversion rates may occur across epidemic sea-sons. Areas with uncommon or rare epidemic activity have very low population infection rates, being less than 5% in the Murray Valley area 7 years after their last epidemic. Cases of MVEV encephalitis occur in most years in the enzootic areas of northern WA and the NT. 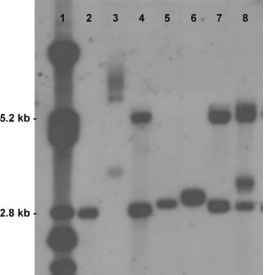 [2,9] (Fig. 1). There is no evidence to indicate that there is any age difference in susceptibility to infection, and patterns of clinical disease reflect the risk of exposure and susceptibility. Therefore in the endemic areas, encephalitis most often occurs in young indigenous children or in adults who are new residents or tourists in the area. [2,4] Epidemic activity causes occasional encephalitis cases further south in WA in the Pilbara and Gascoyne regions,1-2-1 as well as northern Queensland. Rarely, wider spread results in human cases in the southern half of WA and normally arid areas of inland WA and Central Australia. [3,21] Encephalitis in these epidemic areas mainly occurs in adults, presumably reflecting their higher risk of mosquito exposure. Fig. 1 The distribution of reported cases of encephalitis due to MVEV acquired in Australia between 1975 and 2002. This only includes cases where a definite or likely location of infection could be determined. Most cases occurred in the Kimberley region of Western Australia (WA) and the top end of the Northern Territory. 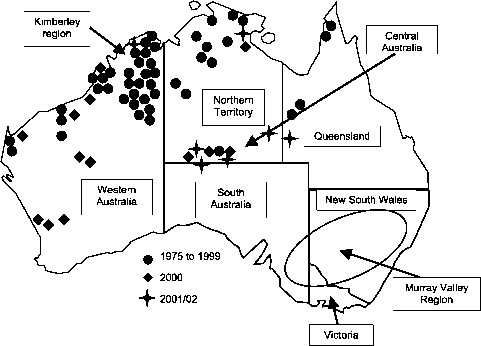 In 2000 and 2001, there was southerly spread in WA and reappearance of disease in Central Australia. Sentinel chicken surveillance picked up MVEV activity in the Murray Valley area of New South Wales in 2001, but without human cases.